US scientists have grown kidneys that produce rudimentary urine in the lab and also after being transplanted into rats. They hope to refine the approach so one day it is possible to grow human kidneys in the lab that work as well as donor kidneys in transplant patients but without the need for them to take drugs to suppress their immune system. The unique approach does not grow a kidney totally from scratch but strips the cells from the old, failed kidney, leaving a 3D honeycomb scaffold of the correct shape, and then repopulates it with donor kidney and blood vessel cells to produce a new, working kidney. This approach has already been used to bioengineer hearts, lungs and livers, but kidneys, which filter the blood to remove toxic waste products for elimination, are one of the most complex organs of the body, and this is the first time scientists have successfully bioengineered one that works. The new study shows the lab-grown kidneys do not perform as well as original, healthy ones, but with refinement the approach shows great promise, say the researchers, who write about their work in a paper published online this week in Nature Medicine. Although around 18,000 kidney transplants are performed in the US every year, more than five times this number of Americans with end-stage kidney disease are on the waiting list for a donor organ. Even when they receive a donor organ, kidney recipients face a lifetime of taking special drugs to stop their immune system rejecting it. This can seriously affect their health, and still doesn’t totally remove the chance their body will eventually reject the donor organ. If the kidney were made of their own cells, they wouldn’t need to take immunosuppressive drugs. Ott and colleagues carried out a study in two parts. The first was about successfully stripping out cells to make a viable scaffold, and the second was about creating a functional organ. For the first part, they stripped the living cells from the donor organ with a detergent solution, leaving a 3D, collagen scaffold of the correct shape and size, with the organ’s complex and intricate architecture intact. They did this with rat kidney, and then moved onto pig and human kidneys and showed it was possible to scale up the process and strip out cells from the larger organs to leave a viable scaffold, with all the organs’ complex structures intact. For the second part, the researchers seeded the rat kidney collagen scaffold with human endothelial cells to re-line the stripped out vascular system, and kidney cells (cortical and medullary) from newborn rats to make the functional kidney tissue. One of the challenges was making sure the appropriate cells went to their rightful places. This involved delivering the vascular cells (to reline the cavities of the stripped out blood vessels) through the renal artery, and the kidney tissue cells through the ureter. They had to get the solution pressures for delivering the cells just right, or they wouldn’t disperse through the whole organ. They then placed the seeded organ to “grow” in a bioreactor for up to 12 days. To test how well the bioengineered organ performed, they connected it to a system that passed blood through the newly formed blood vessels, and then drained off any “urine” the organ produced. They found that the while the “urine” was far from perfect, there was evidence that the new organ was trying to filter the blood. 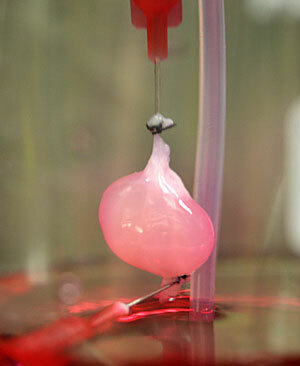 The researchers also transplanted bioengineered kidneys into live rats that had had one kidney removed. They found the engineered organs started producing urine as soon as they were connected to the rats’ blood supply, with no bleeding or blood clots. Again, the kidney function of the engineered organs was far from perfect, compared to normal healthy organs. The researchers say this could be because they used cells from newborn rats to repopulate the scaffolds, and believe a more functional organ could be made by changing the cell types used for seeding and also by improving the maturation process in the bioreactor. Ott says while their study is an initial “proof of principle”, he hopes one day we will see fully functioning bioengineered kidneys being used in the same way as donor organs. “In an ideal world, such grafts could be produced ‘on demand’ from a patient’s own cells, helping us overcome both the organ shortage and the need for chronic immunosuppression,” he adds. The team is now looking at ways to get the correct cell types from patients themselves, and also to improve the seeding process and upscaling the organ growing system to handle human-sized kidneys. Funds from the National Institute of Health Director’s New Innovator Award helped pay for the study. In another recent study, UK researchers show how it may be possible to grow a bioengineered teeth from gum cells as an alternative to implanting false ones.